2002 Flair Franchise Tools DeShaun Foster Dual Jersey & Football Relic Card. DESHAUN FOSTER. 2002 PLAYOFF PRESTIGE. XTRA POINTS GREEN. ROOKIE CARD. CARD NUMBER 175. Player: DeShaun Foster. Set: 2002 Fleer Box Score Red Shirt Freshman. Manufacturer: Fleer Inc. Year: 2002. NO RESTRICTIONS - MIX and MATCH!! (What appears to be scratches or creases may just be scanner marks or lines, feel free to ask). THIS ITEM IS A 2002 TOPPS FINEST ROOKIE REFRACTOR AUTOGRAPH OF DESHAUN FOSTER SERIAL #128/175! THIS CARD WILL MAKE A GREAT ADDITION TO ANY COLLECTION! CARD IS GRADED BCCG 10!. Item#: SGR3. Player: DeShaun Foster. Manufacturer: Upper Deck Co. Year: 2002. Item#: LSDF. Player: DeShaun Foster. Set: 2002 Stadium Club Lone Star Signatures. Year: 2002. Sport: Football. You may have to wait to get a combined invoice if it did not combine automatically. UP FOR SALE IS A 2002 LEAF ROOKIES & STARS TICKET MASTERS FOOTBALL CARD FEATURING CHRIS WEINKE AND DeSHAUN FOSTER. CARD #TH-4. Item#: RGDF. Player: DeShaun Foster. Set: 2002 Sweet Spot Rookie Gallery Jersey. Manufacturer: Upper Deck Co. If a card has a serial numbering you may not be getting that exact numbering unless listed in the title. THIS CARD IS IN MINT CONDITION, NO BENDS OR CREASES, AND HAS PERFECT CORNERS. STRAIGHT FROM CASE/PACK TO TOP LOADER AND STORED IN COOL CLIMATE. THANKS FOR CHECKING OUT MY LISTING. CARD WILL SHIP FAST AND SAFE. PLEASE SEE MY OTHER LISTINGS AS NEW ITEMS ARE PLACED DAILY. ANY QUESTIONS PLEASE ASK, OPEN TO ALL OFFERS. THANKS FOR YOUR TIME. 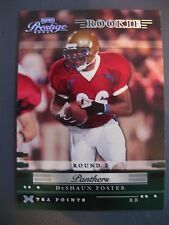 2002 Flair DeShaun Foster Rookie Premiere "DUAL MEMORIBILIA" 15/50 Card JK5. 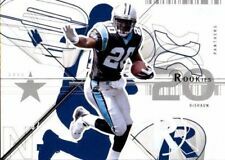 2002 Donruss "RATED ROOKIE" Deshaun Foster #219 Panthers Football Card JK2.